This GMC Sierra 1500 boasts a Gas/Ethanol V8 5.3L/323 engine powering this Automatic transmission. ENGINE, 5.3L SFI FLEX FUEL V8 (VORTEC) -inc: active fuel management, Windshield wipers and washers -inc: intermittent wiper system, demand-type washer system, Windows, rear, power. *This GMC Sierra 1500 Comes Equipped with These Options *Windows, front, power with backlit switches and lockout feature -inc: driver express down, Transmission, 4-speed automatic with OD -inc: tow/haul mode (REQ: L20 Engine), Transfer case, electronic autotrac with rotary dial controls, Theft deterrent, electronic immobilizer, Sunshades, left/right hand padded with lighted visor mirrors, Steering wheel, leather-wrapped, Steering wheel and column, tilt-wheel, adjustable with brake/transmission shift interlock, Stabilitrak electronic stability control system with Proactive Roll Avoidance -inc: electronic trailer sway control, hill start assist, Spare tire, full size 432 mm (17) steel spare, Spare tire lock. * The Experts' Verdict...*As reported by KBB.com: If your towing needs run in the 7,000-10,000 pound range, a compact pickup isn't going to cut it; the full-size 2013 GMC Sierra, on the other hand, will. Models range from a basic Work Truck to the frugal 23-mpg Sierra Hybrid to the luxurious Denali. 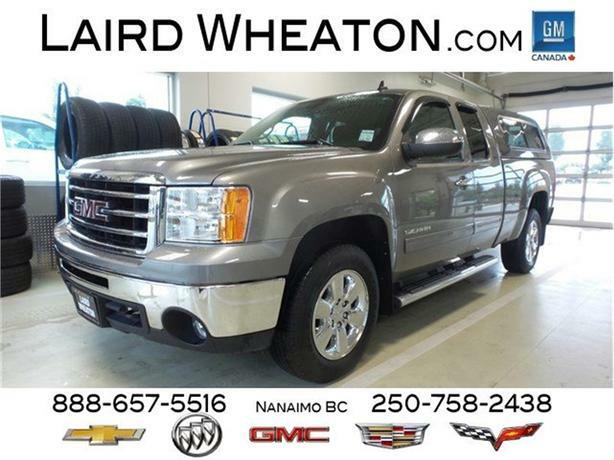 * Visit Us Today *For a must-own GMC Sierra 1500 come see us at Laird Wheaton, 2590 Bowen Road, Nanaimo, BC V9T 3L3. Just minutes away!